Battery Backup Switch Unit & Smart Charger, Solid-State, PG40S, Super PWRgate, Powerpoles, 40A, 12V. From non-smoking, non-pet home. Good condition. Shipped in original box. 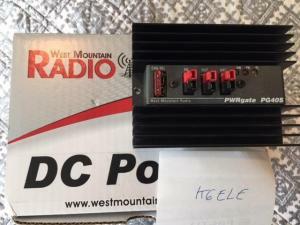 West Mountain Radio Super PWRgate PG40S Battery Backup Systems has two 80 ampere Schottky diodes configured as an OR-Gate, they isolate and switch your equipment between power supply and battery operation. Capable of safely handling a continuous 40 amperes on almost any 12V power supply and battery combination, they make a true solid-state UPS .With a built-in four-stage, high-power, current limit selectable smart battery charger.